ADJ Believes That 4 Heads Are Better Than 1! The original Quad Scan LED became an overnight success for American DJ, offering four compact scanner heads in one system. Now, with the brighter 10-Watt Quad Scan Pro, ADJ is upping the brightness so DJs, small clubs and bars can bring even more colour and movement to their parities and venues. 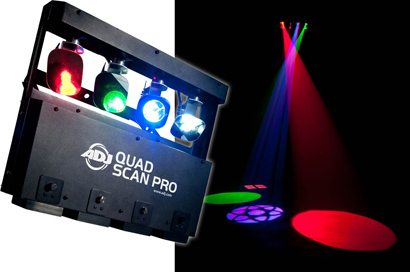 The new ADJ Quad Scan Pro is powered by 4 x 10-Watt 4-IN-1 LEDs, which means one red, green, blue and white light source are packed into each LED diode. This allows for better colour mixing, brighter beams and more excitement on the dance-floor. Each scanner is equipped with one unique GOBO pattern inside a removable GOBO holder. This allows users to insert their own custom GOBOs, or they can completely remove the GOBOs so that each scanner projects a colour spot, allowing for more diversity and creativity from a single fixture. The GOBO size is 20.5mm with a viewable area of 12mm. The Quad Scan Pro has three operational modes: DMX controlled, Master/Slave or Sound Active. With DMX hardware or software custom programming may be created to fit a DJ’s vision for a one-of-a-kind light show. Using the Master/Slave function multiple fixtures may be linked together to mimic each other, or they can do the opposite of each other when the pan and tilt inversion settings are activated. Sound Active mode picks up the bass sound of the music through the unit’s built-in microphone and controls the movements of the mirrors and colours. There are 16 built-in light shows. So users don’t have to be lighting programmers to make the Quad Scan Pro look fantastic. 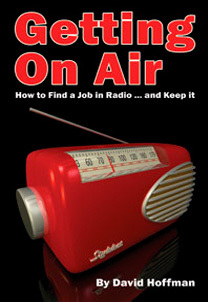 Just set it to the desired mode and let it go! There are three different DMX channel mode options (1, 5 or 32 channels) on the Quad Scan Pro. The unit is also compatible with ADJ’s easy-to-use UC3 controller (sold separately), which gives non-DMX users the ability to turn the unit on/off and activate built-in programs. Multiple Quad Scan Pros (up to 7 units @ 230V) can be daisy-chained together via the unit’s IEC AC in/out connectors to cover venues of all sizes. Perfect for working DJs, the Quad Scan Pro is very compact and lightweight; its rectangular shape lends itself to easy transport and storage. Designed to be very budget-friendly too, the highly portable unit does the job of four scanners and more. This 4-headed scanner is perfect for those who want a big bang effect that can be set up in seconds. It may be used with fog – for mid-air beam effects, or without fog – projected on to ceilings, walls and dance-floors. Other performance-enhancing features include a digital LED DMX display with 4-button menu on the rear panel that makes for incredibly easy navigation; an electrifying strobe/pulse effect, with random strobing from slow to fast; and intensity control via complete dimming from 0–100% via DMX. Although it covers big areas, the Quad Scan Pro consumes very little energy, drawing just 88 watts of electricity at maximum use. Maintenance costs will be kept to a minimum as well, since the unit’s four long-life Quad Colour LEDs have a lifetime rating of 50,000 hours and virtually never need replacing. Equipped with a built-in fan, the Quad Scan Pro can run all night without duty cycles. Designed for easy portability and packing a powerful punch for its size, the compact and lightweight fixture measures 438 x 338 x 126mm and weighs only 7.5 kg — making it especially attractive for mobile DJs and traveling performers. Users can easily attach hanging clamps and safety cables to the provided hanging bracket and safety hook for worry-free mounting.